The day after No-Li Brewhouse put its newest offering into bottles, brewer Mark Irvin was back at it, leaning over a vat of his next creation. He took a few minutes to tell The Inlander about Wrecking Ball Imperial Stout, the beer that is the latest No-Li brew to arrive in stores (look for it at Rosauers, Yoke's and URM), where it will be found in the coming days. “The public has been demanding a porter or a dark stout from us, and this is our answer to that,” Irvin says. 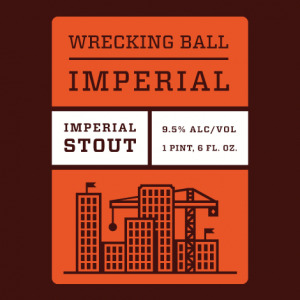 The Wrecking Ball, true to its name, weighs in at a powerful 9.6% ABV. So yeah, it makes your cheeks warm almost immediately. That said, it’s not overbearing by any means and drinks smoothly, with its chocolaty back end making it a perfect after-dinner drink. The name isn’t meant to mean that the beer is an assault on your taste buds, but rather an indication of how No-Li — less than a year after its rebranding — is breaking down your perception of the brewery as it continues to expand. “As No-Li continues to push craft beer boundaries with an abundance of fresh, local brewing ingredients, Wrecking Ball is designed and constructed to demolish all preconceived notions,” says Irvin. Irvin and partner John Bryant then took me on a tour of all the new stuff they’ve got going at No-Li, including 7,000 feet of new space and four new fermenters. We’ll fill you in more about No-Li’s plans and role as the big brother of the Spokane brewing scene in April for our first ever Beer Issue.